Android users can install apps from Google Play or even if they have downloaded apk file from the internet they can install with that file. If they have enabled “Unknown Sources” from phone settings > privacy. So what if we want to download apk file from Google Play directly, to have an official apk file of that app. In this post, I will show you how to do that. 1) First of all, we need to open that app page in the store, in our browser and copy the URL link of the app. 2) Now go to this website and paste that app link you just have copied and paste it into the text box, press on “Generate Download Link” button. 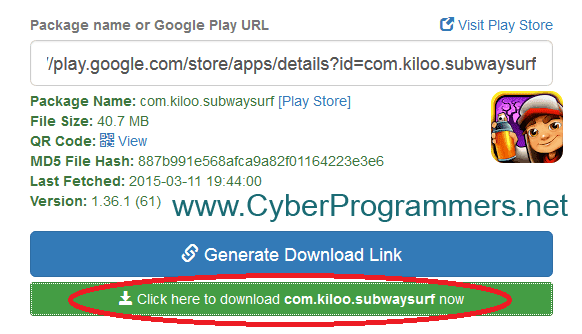 3) After it will generate a downloading link and you can press on the green download button. So that’s it, now you can download apk files from Windows/Mac/Linux even from your phone or tablet using any browser.